When I was younger and played a bit of tennis, I was constantly dreaming of one day playing at Wimbledon and breaking the record of Bjorn Borg at that stage, of course this was unlikely as I was only in the Under 13B team at my school, but you can blame a kid for dreaming. 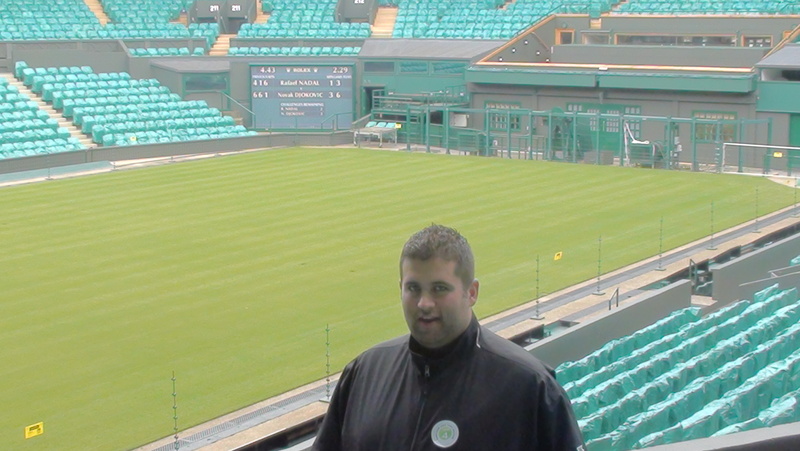 My love affair continued with Wimbledon when my favourite player Pistol Pete started dominating the lawns and even through the turmoil I have experienced as a fan of the crowd pleaser Andy Roddick. So when I was recently fortunate enough to be in England for a few days, I rushed to take the opportunity to do what can only be described as a whirlwind sports tour. 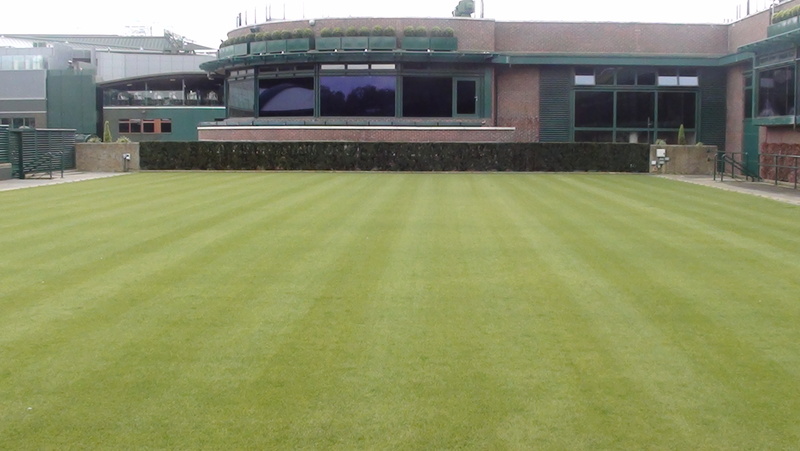 Along the tour I encountered one of my childhood dreams, the lush and beautiful lawns of the All English Club. The history of the greatest tennis tournament in the world is not one that is commonly known and is something of folklore in these parts. In the 1876 there were regular tennis matches at the club as the All England Croquet Club was renamed to become the “All England Croquet and Lawn Tennis Club”. Of course in the days prior to BBM, Whatsapp, laser technology and David Hasselhoff, the technology for the lawn was quite a simple process of pulling a pony roller across the lawns. 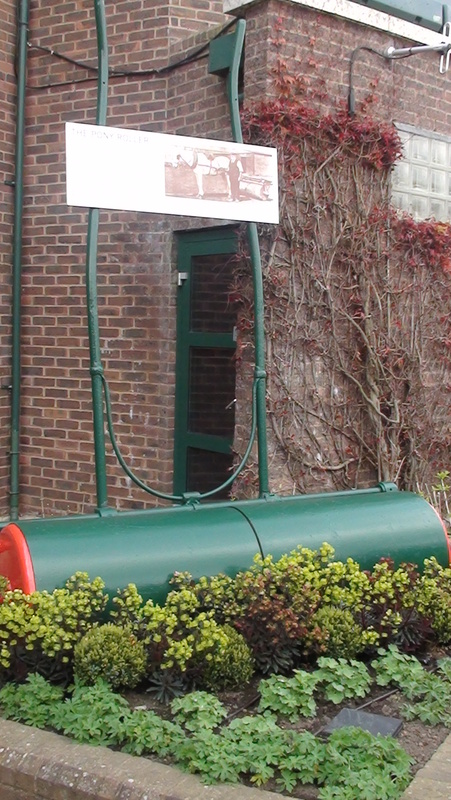 In 1877 this roller broke. The members of the club could not afford to repair it and decided to host a tournament to raise funds. Enter 22 men and 200 spectators and the first ever Wimbledon championship was held and Spencer Gore became the first ever Wimbledon Champion. The success of the event was greater than John Terry with his team mate’s wives and led to the All England CLTC hosting it again the following year. Now I don’t want to bore you with history, but that amazing titbit was one of the most incredible things I have heard and reminds me that sometimes some of the greatest things are borne from some of the strangest stories. 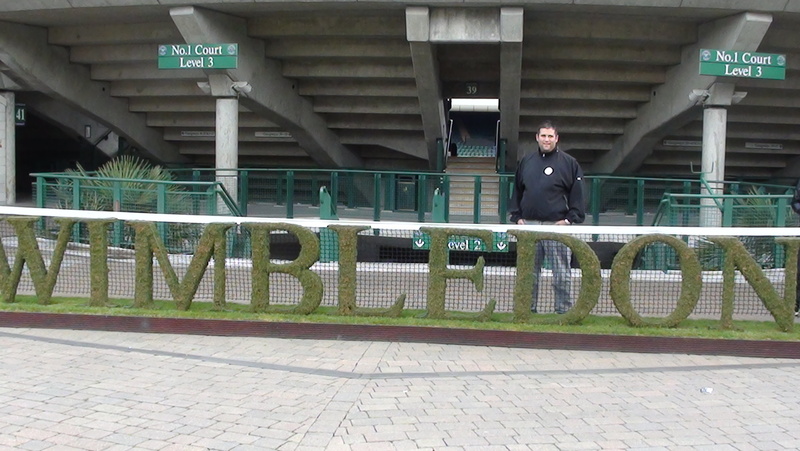 The tour takes you around Wimbledon and the fact that most of the courts are not played on for the whole year and are prepped from just after the Championship until the start of the following years Championship shows you just how much work goes into preparing the All England Club for the greatest tennis tournament on Earth. As you wander along you are greeted by last year’s brackets with results that ended in victory for two new comers Novak Djokovic and Petra Kvitova. As a South African you will be proud to see the names of Wesley Moody, Kevin Anderson, Chanelle Scheepers and Rik de Voest in last year’s main draw. 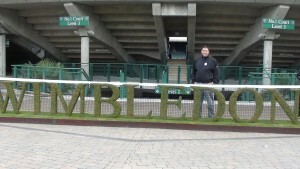 For any true sports fan it is a magnificent feeling as you walk through the club and know that the likes of Federer, Sampras, Ivanisevic, Edberg, Graf, Borg, Laver and more have all walked along this turf on their pursuits of the trophy. You also are greeted by a statue of Fred Perry, the last British man to win the Gentleman’s Singles title, a fact that hurts the Brits more than the Protea’s hurt South Africa. 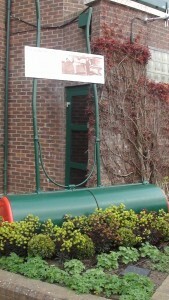 From here you move along to Henman Hill, where 3000+ day visitors gather to watch the centre court action. Of course it could well become Murray Mound if Andy finally breaks the hurt away from the hordes of locals. 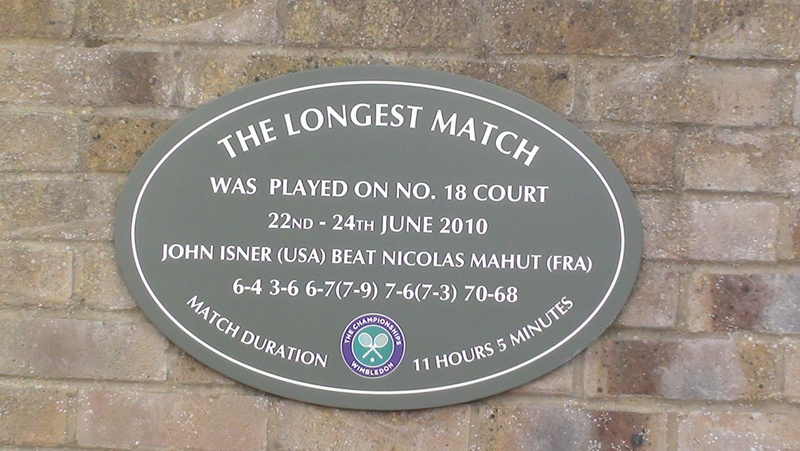 Another great story that emerges as you make your way around the famed lawns is that of the longest tennis match in history. Probably the only time that a loser of a match will be remembered as much as the winner of the match. 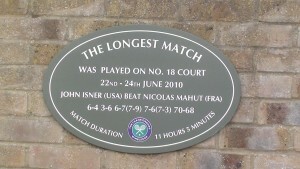 John Isner of America and Nicolas Mahut of France took to court 18 on the 22 June 2010, and finally left it with their match completed on 24 June 2010. A match that lasted 11 hours and 5 minutes, almost 5 hours more than the 2nd longest game in tennis history. The match garnered so much interest that John McEnroe left his commentary booth at centre court to sit court side on 18 to watch them. The match has been commemorated with a plaque to honour the record breakers. The ironic thing is that they met again in 2011, but Isner made much easier work of it this time around! The highlight for me was Centre Court. Yes Court 1 is amazing and the 11000 seater is special, but the 15000 seater Centre court is where the history burns through you. The score from the most recent game played on the court remains on the scoreboard at the club, that game was last year’s Men’s final, where Djokovic beat Nadal. The history and tradition is etched all along the club as everything is either green or purple, the colours of the club, from the chairs to the carpets. Upon completion of the tour you can go to the shop and buy a whole bunch of overpriced insignia, but more interestingly you can head on down to the museum. It’s interactive for the kids and informative for the adults. And once again a further reminder of how important history is to them.